Shining Lotus: "I Love What You've Done with the Place"
And, the flooring ... it's fabulous. This is what we were laughing at about an hour ago when Shawn looked around our basement. 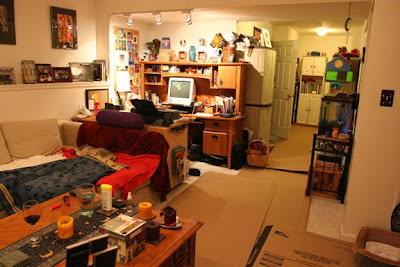 The entire basement is covered either in blankets, cardboard or newspaper. But it's clean. And if it gets mucked up again ... it can be cleaned VERY easily. Tiki's issues have continued for several days. Wednesday there was puke everywhere. Thursday evening Shawn and I had a puke cleaning party, cleaned the basement, scrubbed, etc.. only to wake up Friday morning to an even worse mess. Our mantra these days is "We are grateful for the cardboard." 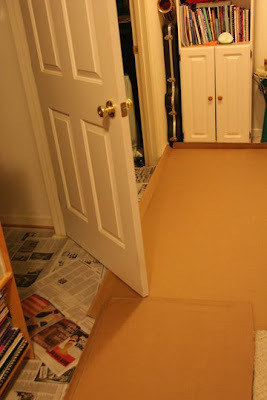 Shawn has these HUGE pieces of cardboard that we put down to protect the carpet. Why didn't we think of this sooner?????? So I cleaned up everything again only to, once again, wake up to a stinking mess. When was the universe going to cut me a break?? Well, the universe cut me a break by taking our internet down, thus making it impossible for me to worry about posting a pic yesterday. It took one thing off my to do list that made a difference. The universe also sent me some wisdom that I should have thought of WAY sooner, put some newspaper down for god's sake! So now, the basement is covered and protected. And if I wake up tomorrow to a nasty mess, all I have to do is pick it up and throw it away.